Farmer's Market, a pot of coffee, and too many unfinished projects - Stop staring and start sewing! 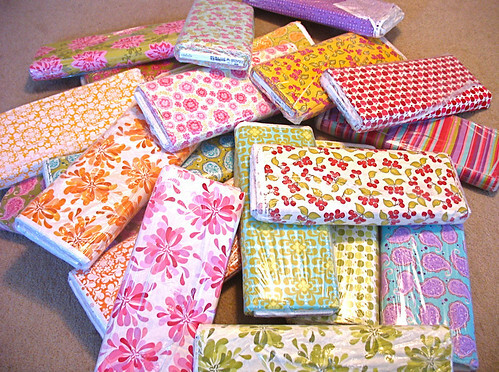 Well my Farmer's Market fabric finally arrived yesterday to much whooping and hollering (I think this is why the UPS guy likes to sneak the boxes up to my doorstep, ring the bell and run for the truck). I have all but 4 prints (which are on back order) but I'm very happy because I got all the ones I really wanted (the cherries!). So this morning I made myself a pot of coffee and sat down to put them all in the store. Here's some of it. I'm trying to find shelf space now. A huge thanks to those of you who have shared the pictures of the skirts you have made using the Edith Twirl Skirt pattern! I'm amazed at all the creativity out there and I really love seeing everyone's ideas. I've set up a Flickr group for sharing and inspiring. Since I've sold quite a few (by my standards,not Amy Butler's!) I thought it would be fun to have a drawing for all of you who have purchased the pattern (and maybe this will help those who bought it but haven't used it yet!). 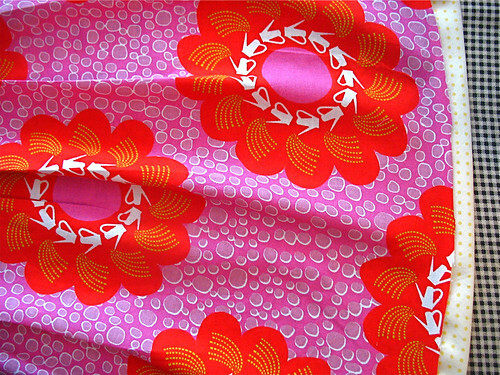 The winner is going to get a Edith Twirl Skirt kit made from Farmer's Market fabrics (I get to pick them!). I'll even include matching embroidery floss if you want to embroider the ruffle. I'll draw the winner on Monday (Labor Day) so I have something to do while I'm stuffing myself with goodies off the grill. I've been busy sewing but I don't feel like I have much to show for it. I swear when I die my headstone will say "She had good intentions". I'm almost done with this darling pleated skirt I'm making for Olivia (I made her fold and press the pleats since I hate doing pleats). We saw this cute watering can fabric at IKEA and it was marked down to 3 yards (54" across) for 9.00. I have the zipper in (invisible!) and the lining cut out, I just need to put it all together (the yellow polka dots are the intended bias hem). Cute so far! 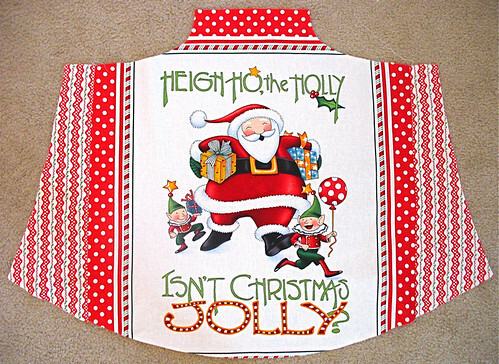 I also have this unfinished Anna Wrap Dress I'm making using a quilt panel from the Isn't Christmas Jolly? line. The panel is pretty big so I'm making a size 5/6 in order to fit the whole picture in. You can used a smaller size but you'd have to trim some of it off (which I've seen done and it's still cute). I added fabric on the sides to make the whole pattern piece and I'm going to add ruffles (I'm thinking gold) to spruce it up. These quilt panels are nice because I used one panel for this dress and for this outfit I made awhile back. 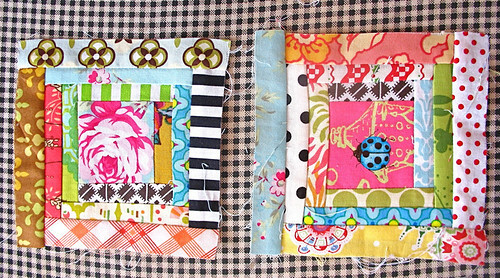 I did finish a couple more scrappy squares though so I do feel a small sense of accomplishment. Aren't they cute? Someday I might actually have a quilt! Hopefully I'll have some finished things to show next time! !